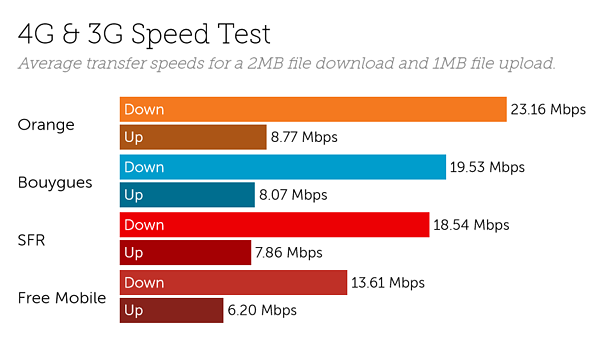 Orange continue to perform best across France for both download and upload speeds, as Free Mobile lead latency. Orange also demonstrated the best network stability with the lowest average results for jitter and packet loss between October and December 2018. Orange lead download speeds across both 3G and 4G with average speeds of 23.16 Mbps based on more than 650 thousand download tests. Bouygues averaged 19.53 Mbps, followed by SFR and Free Mobile, which averaged 18.54 Mbps and 13.61 Mbps respectively between October and December 2018. When 3G and 4G tests are split, Orange reached average speeds across the country of 27.14 Mbps, and the highest average of 32.12 Mbps in Ile-de-France. On both 4G and 3G, Free Mobile perform best for latency, averaging 13.8 ms and 53.7 ms respectively. Orange follow in second place, with average results on 4G of 17.3 ms, but drop to fourth on 3G where latency delay averages 70.8 ms. Bouygues and SFR placed third and fourth respectively on 4G with average results between October and December of 18.6 ms and 21.4 ms.
With the lowest average results for jitter and packet loss of the four mobile operators, Orange perform best for network stability on 4G. 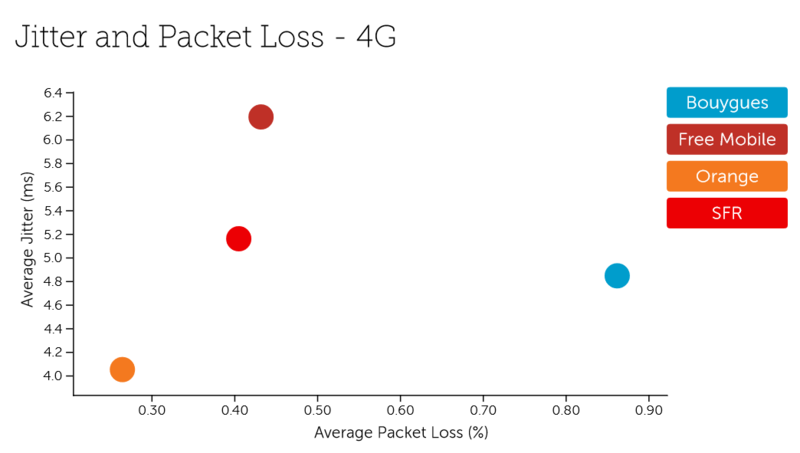 In Auvergne-Rhône-Alpes and Provence-Alpes-Côte d'Azur, Bouygues demonstrated the lowest amount of average jitter but was let down by its relatively high packet loss. Our findings for France are based on 35.9 billion network quality measurements including 6.19 million speed tests between October and December 2018. Our latest complimentary Mobile Experience Report is available to download from the Tutela Insights portal.